Two key MERIT projects are set to be launched in the coming weeks. In just a few weeks’ time, the MERIT Vanguard programme will be launching two more of its key Crisis Care projects, allowing mental health trusts in the West Midlands to work more closely together for the benefit of local patients. 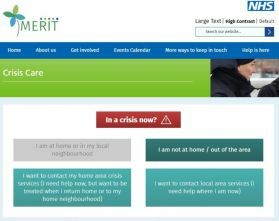 The partnership has already launched a dedicated Crisis Care section on its website, allowing anyone – staff, carers or service users themselves – to find out which services are available to provide care to someone during a mental health crisis, regardless of where in the West Midlands they live. The Electronic Health Record Viewer means that, if a patient from one trust seeks care from another in the partnership (perhaps after using the Crisis Care website), clinicians there will have an up-to-date understanding of the patient’s needs without the need to ask repeated questions at what may be a distressing time. This will be the first mental health trust collaboration in England to allow authorised professionals to share controlled access to mental health diagnoses, treatment, risk assessment and care plans. The MERIT Bed Finder will offer bed managers in each of the partner Trusts the opportunity to view the status of beds at each other’s organisations. It will hold no data about anyone who may occupy or require a bed but, once it’s fully operational, the new system could cut the number of inpatients who have to be placed outside the West Midlands, allowing them to stay closer to the family, friends or other support networks which are often crucial to a successful discharge. Colleagues from the MERIT partnership will be speaking with affected staff groups over the coming weeks to discuss the new electronic packages and how they can help improve patient care.